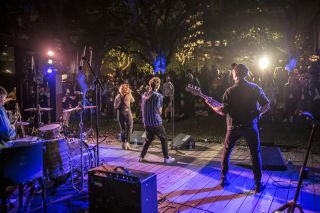 Meyer Sound was proud to be the Official Sound Partner of two brand activations at SXSW 2019: the House of Scandinavia, hosted by SAS—Scandinavian Airlines and Rev Worldwide, and the Relix Roadie Lounge at the Brooklyn Bowl Family Reunion. The lounge featured six Meyer Sound self-powered systems comprising UP-4slim loudspeakers and MM-10ACX miniature subwoofers, managed by a Galileo GALAXY processor. Two Amie monitors and a USW-210P subwoofer were on hand to showcase their power for those entering a prize giveaway to win a pair of the Amie precision studio monitors. The randomly-chosen winner of the Amie monitors contest is Heather Thomas, drummer and vocalist for the Seattle-based psychedelic rock band General Mojo’s. SAS—Scandinavian Airlines partnered with Roskilde Festival, Northern Europe’s largest music festival, to curate performances by top Nordic acts, including Denmark’s Lowly and Norway’s Death By Unga Bunga. For Roskilde, that meant specifying systems by Meyer Sound, which has partnered with the festival to provide sound reinforcement as well as collaborate on educational and R&D initiatives.